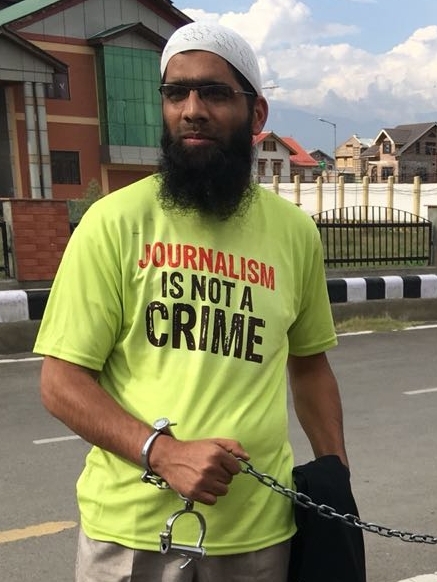 Srinagar: The Jammu and Kashmir Police have accused journalist Asif Sultan of hatching criminal conspiracy, “harbouring militant” and giving support to the “proscribed” militant organisation. Srinagar police filed a chargesheet against ten accused persons including Sultan for allegedly sheltering militants who killed police constable in a shootout in Batamaloo area of Srinagar city in August last year. A police spokesperson in a statement said that Srinagar Police submitted the charge sheet in respect of case FIR No 173/2018 of police station Batamaloo. The spokesperson said that the FIR pertains to the incident dated August 12, 2018 when militants hiding in a residence at Diyarwani, Batamaloo, Srinagar fled away from the spot after indiscriminately firing at Police party and killed one police personnel Parvaiz Ahmad. The chargesheet, the spokesperson said, has been filed against ten accused including Muhammed Shafeeq Bhat, Waseem Khan, both residents of Diyarwani, Batamaloo; Bilal Ahmad Bhat, a resident of Kund Qazigund; Shazia Yaqoob alias Pari, a resident of Kamad Anantnag and Asif Sultan, a resident of Firdousabad, Batamaloo for their role in hatching criminal conspiracy, “harbouring terrorist” and giving support to the proscribed militant organisation besides substantive offences of law as mentioned above.